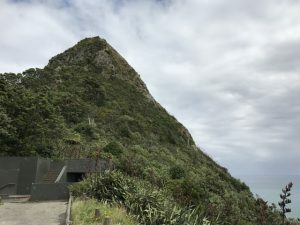 This rock along with the Sugar Loaf Islands are distinctive and visible from much of the New Plymouth coast but did you know that you can walk up Paritutu? It’s really not a long walk in terms of distance but due to being really steep and rocky under foot, it’s not for the fainthearted or those that suffer from vertigo! The walk starts from the carpark and goes steadily uphill with a series of steps. 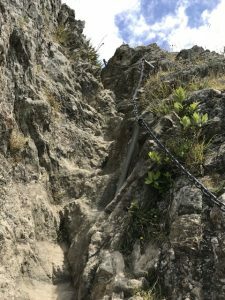 When the stairs end, the path is a rocky surface with a chain in place for use as a hand rail. In theory this walk up should only take about 15 minutes but if it’s busy, you’ll need to wait on the rocky part for people descending as it’s oneway and narrow. It might also take longer if you’re helping kids to figure out where to place their feet. In places it definitely feels like you’re rock climbing which can be quite fun for kids! 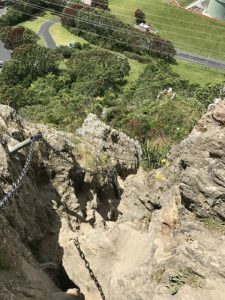 You can of course turn round at any point but if you make it to the top, you and the kids will be rewarded with a great sense of achievement and amazing views of the Taranaki coastline. Urge your kids to take it slowly in both directions – this is not a path to race up and it can be slippery even if it’s dry under foot. For this reason, it’s also a good idea to wear closed shoes with a good sole rather than jandles. Take an extra layer for the top as it’s exposed and can be very windy. Look out for seals that play in the sea and rocks down below. They’re hard to spot so you might want to take binoculars for kids to use. Address: The carpark is sign posted just off Centennial Drive, New Plymouth. 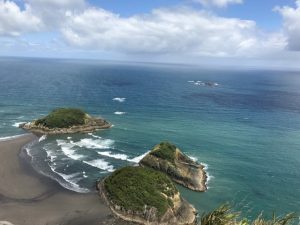 It’s about a 10 minute drive from the centre of New Plymouth.